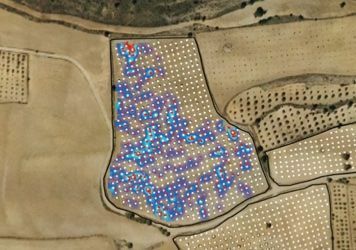 Thanks to data gathering of each truffle by GPS in the field, it is possible to obtain a map of truffle production per plot in each season. All information is treated confidentially and exclusively with the customer, without being uploaded to the cloud. Tell us about your orchard and we´ll help you to create a map for you. Acquisition and customization of GPS receivers: GARMIN Dakota 20 (200 € / unit). Truffle hunter will simply be equipped with a GPS attached to the forearm and at the time of digging up a truffle, will record a point that will be the basis for the development of production maps. 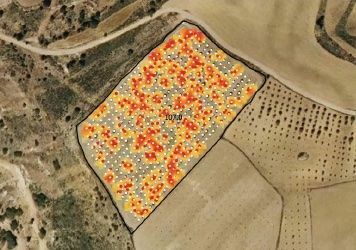 At the end of truffle season data are provided to MICOLOGíA FORESTAL & APLICADA and using Geographic Information System, will produce maps with the corresponding yields: “Truffle Season Production Report”. This will allow both the technical and the owners of the farm have more information on its operation and make decisions that have an impact on better farm management in order to obtain better yields. MICOLOGíA FORESTAL & APLICADA will provide the necessary training for hunters to use the technology so data gathering is achieved. These systems are only recommended for those farms that have gone into production. Get a digitized database of your plantation. Knowing which trees are the best producers and have a record of output per campaign. Compare treatments, irrigation dose fertilizers by sector and campaigns. Optimize resources, i.e. detecting areas / non-productive trees to treat specifically. The system allows providing weekly yeilds (weights), to extrapolate an average size/weight of truffles and analyze by sectors or seasons. To create an annual report to present to members or stakeholders. 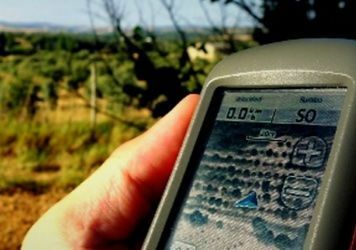 GPS receivers are devices designed to work outdoors with greater autonomy than smartphones. More information can improve yields. Greatly simplifies data gathering by truffle growers with low implementation costs.